Capt. 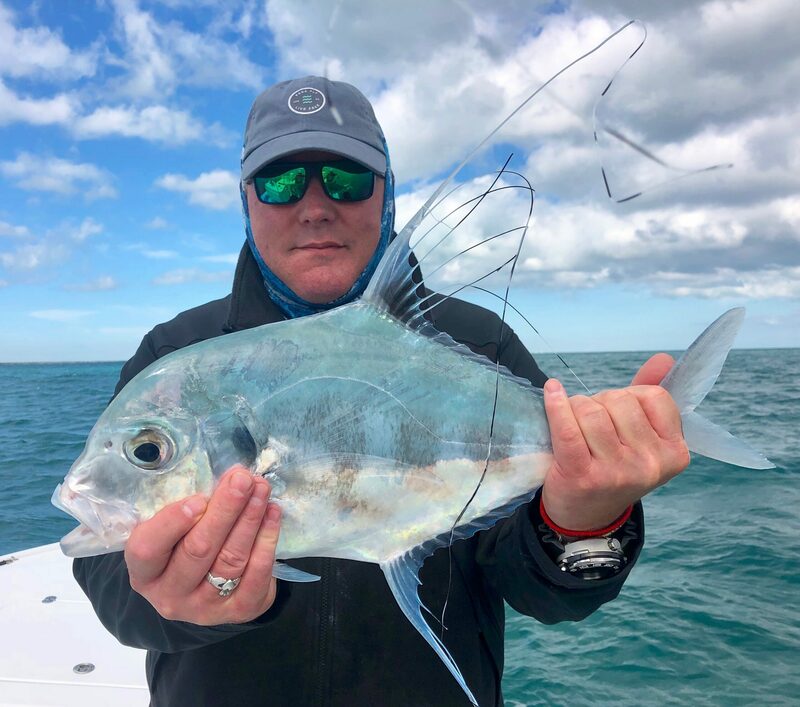 Raul Montoro is a professional Miami Fishing Guide with over 20 years experience fishing the waters of Biscayne Bay, Everglades National Park, and the back country of the Florida Keys. A native of South Miami, FL – Capt. Raul specializes in guiding resident and visiting light tackle enthusiasts for trophy bonefish, permit, and tarpon. Guided fishing trips in Miami, FL are the perfect opportunity to enjoy one of the most pristine and visually profound landscapes in south Florida – as Biscayne Bay is the watershed which marks the northern most tip of the Florida Keys. Two of the key characteristics that make Capt. Raul an outstanding Miami fishing guide are his attention to detail and patience. 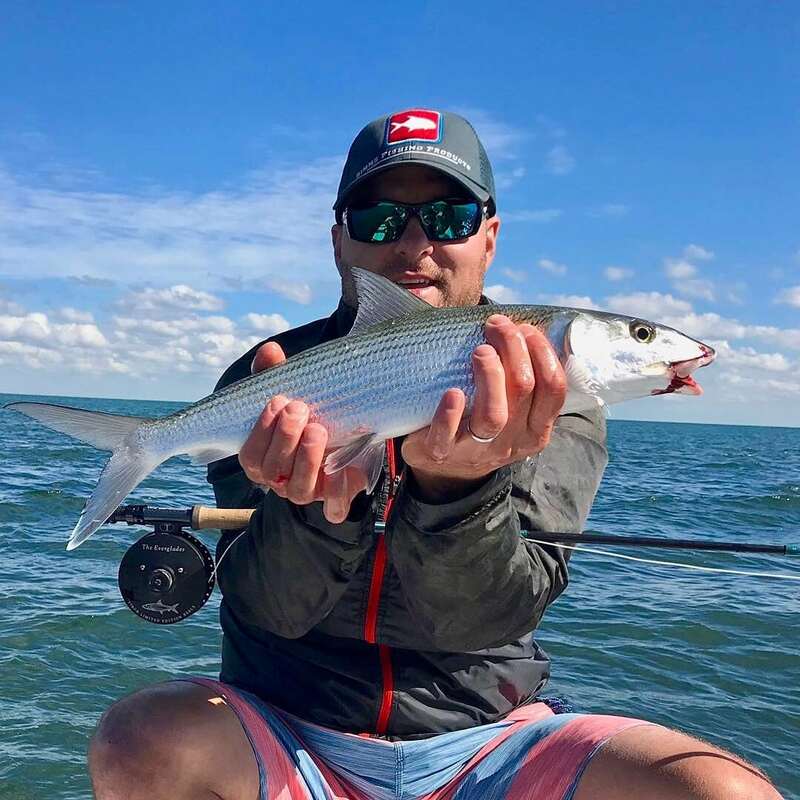 Mastering flats fishing in Miami, FL takes years of practice, precision, and dedication – all of which are shared during every guided fishing trip in Biscayne Bay, Everglades National Park, and the backcountry of the Florida Keys. Raul is a passionate shallow water angler who enjoys putting his clients on schools of tailing bonefish, rolling tarpon, and cruising permit. From the time he leaves the dock to the time he returns, his goal on every guided fishing trip is to maximize opportunities to connect with the fish of a lifetime. This is the ultimate in technical flats boats. Made out of 100% Kevlar material, it runs through the roughest of chop while keeping you dry, and at the same time floats in the skinniest of water. With a range over 100 miles, Capt. Raul will do whatever it takes to get you safely where the fish are biting. Number of anglers – maximum two. We are proud to announce that Shallow Tails Guide Service is now offering trips aboard our brand new 24 BillFish Bay Boat. This custom engineered inshore fishing boat was meticulously crafted with Kevlar and a Vinylester Resin & Vaccum Bagged PVC Foam Core Hull. It is rigged with premium stainless steel hardware and top of the line electronics – featuring a top-of-the line Garmin GPS, Power Pole, and state of the art Minn Kota autonomous trolling motor. The 300HP Mercury Verado dishes out plenty of power, making for a fast, smooth ride. This boat is one of a kind, and the ideal Miami inshore fishing charter boat. With an 8ft 6″ beam, the BillFish 24 is the most stable vessel in its class. Drawing only 12″ of water, you can comfortably fish the flats of Biscayne Bay with precision and ease, then dip to the barrier patch reefs, or even offshore for larger pelagic species. The layout of the deck was designed with comfort in mind, allowing for plenty of walkable deck space and flush mounted fittings to prevent any snags or trips. Non-skid deck and gunwales ensure stable footing in any sea condition. 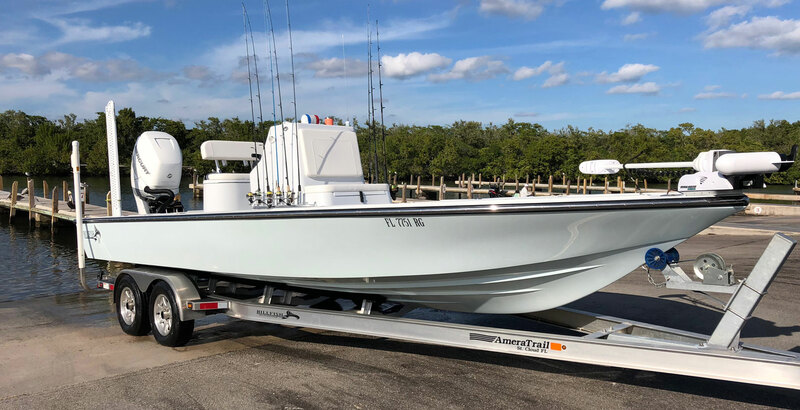 In addition to a self bailing cockpit and 25 gallon stern livewell, this BillFish 24 Bay Boat was built with a high-flow leaning past live well that can hold hundreds of frisky baits, all day. The open platform supports up to four anglers very comfortably, with plenty of bow and stern space to fight tarpon, snook, sharks, and stubborn reef fish. So what are the advantages of chartering a Bay Boat over a flats skiff? For starters, bay boat fishing in Miami is incredibly versatile. A deeper hull means more stability and comfort when fishing choppier waters, such as the patch reefs off Elliott Key or Ocean Reef. The extra room on board means allows for more anglers, which is perfect for family fishing trips or anglers who need a bit more space to stretch out. The BillFish 24, uniquely, provides enough storage and seating to accommodate extra equipment, which means we can carry a larger variety of rods, reels, and tackle – allowing us to target even more species during a charter. The oversize high-circulation bait wells enable us to fish for species such as grouper, mackerel, yellow jacks, and even pelagic species such as sailfish or kingfish on the deepwater edge of Miami’s barrier reef system. Bay Boats are also ideal for tarpon fishing – the stability and maneuverability of a wide deck means more balance for the angler (a decisive edge when battling 100lb plus Silver King’s). With the new Minn Kota iPilot GPS trolling system, our BillFish 24 can stealthily stalk pods of fish, or remain precisely on station when a fish is hooked up. One of the highlights of booking a miami inshore fishing charter is that you can target multiple species in a day. When fishing from a Bay Boat, like our BillFish 24, anglers have the opportunity to experience all that Miami inshore fishing has to offer – comfortably and confidently. From grouper to sailfish, the newest addition to the Shallow Tails Guide Service fleet can get it done. Call Capt. Raul today at 786-390-9069 or email capt.raulmontoro@gmail.com. Number of anglers – maximum four. Choosing a fishing guide in Miami, Florida isn’t easy. There are dozens of guides between Biscayne Bay and Islamorada. If you choose to fish with Capt. 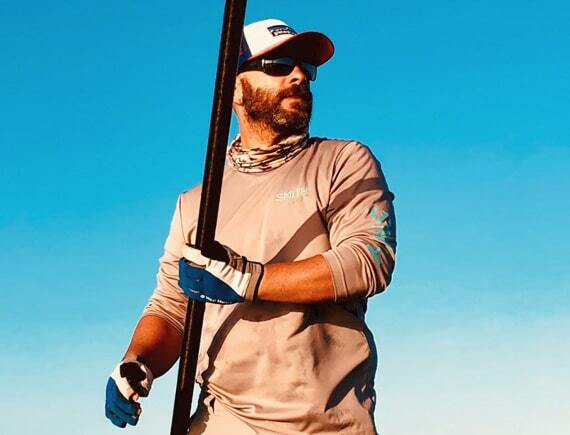 Raul, you are choosing to fish with a native, full time flats fishing guide with unwavering dedication to providing an exceptional charter experience. 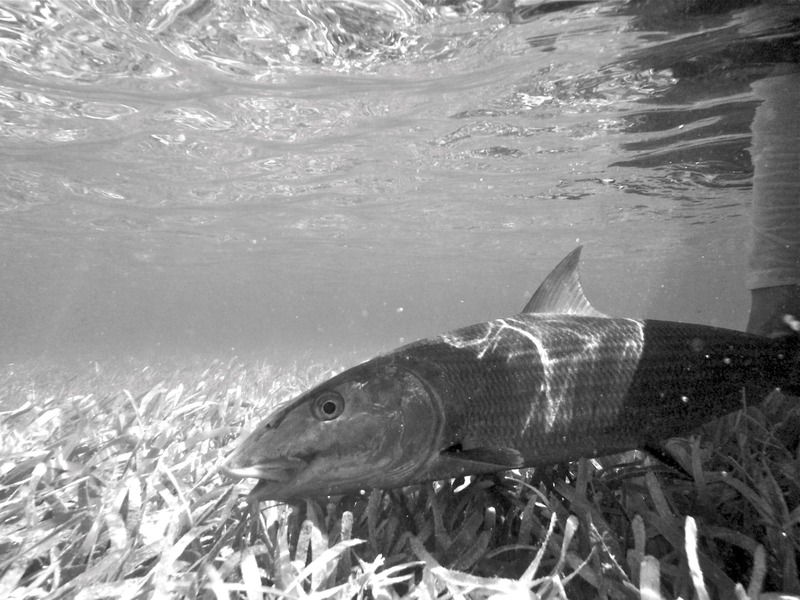 Whether it’s poling the flats of Biscayne Bay in search of bonefish, or chasing giant tarpon around the bridges of Islamorada – Capt. Raul always goes the extra mile to ensure his clients experience the best of South Florida fishing. We encourage you to check out reviews for Shallow Tails Guide Service on Tripadvisor, Google, and the Orvis website. If you are interested in a specialty trip, or simply want to learn a bit more about fishing with Capt. Raul, please call 786-390-9069. A $200 deposit is required to hold your charter date, which can be placed by Credit Card with Capt. Raul or through PayPal. Shallow Tails Guide Service welcomes anglers of all skill levels, offering full day, half day, and multi-day fishing charters.